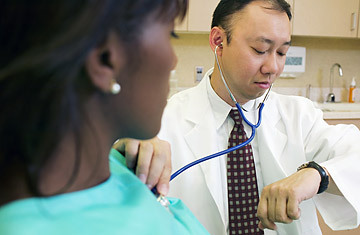 A physician examines a patient's heartbeat. For decades, heart disease has had the dubious honor of being the leading killer of Americans. Most heart-related deaths happen among the elderly, by far the largest at-risk group for cardiovascular disease. But a new study finds that an alarming portion of heart failure cases are occurring in a much younger group  under age 50  and overwhelmingly among African Americans. The new report, published in the March 19 issue of the New England Journal of Medicine, is a large government-funded survey that began in 1985. The aim of the study was to document the frequency of heart disease among young adults, so researchers recruited more than 5,000 volunteers from four cities and tracked them for 20 years, measuring their blood pressure, weight, cholesterol, fasting blood sugar and kidney function. These tests were repeated six times over the two-decade period. The black adults who developed heart disease early had at least one of four risk factors  high blood pressure, being overweight, chronic kidney disease or low levels of "good" cholesterol (high-density cholesterol, or HDL). Blood pressure and heart risk rose in step: for each 10 mm increase in diastolic blood pressure (the bottom number of the ratio), the risk of having heart failure in their 40s doubled. For each 5.7 increase in body mass index (BMI), a ratio of weight and height, the risk of developing heart failure increased by 40%. And each 13.3 mg/dL drop in HDL levels also boosted the risk of heart disease by 40%. But the largest risk factor for heart failure among this group was chronic kidney disease, a condition that is often triggered by untreated diabetes and obesity. Black adults with chronic kidney disease experienced a stunning 20-fold jump in their risk of heart failure, compared with black adults without kidney disease. "Here we have tangible evidence that heart failure in the young is a real dilemma," says Dr. Clyde Yancy, president-elect of the American Heart Association. "The number of individuals with controlled blood pressure is embarrassingly low," says Yancy. "That indicates a problem not only of understanding the biology of blood pressure, and why it occurs more frequently in young African Americans, but also why we aren't intervening more aggressively and effectively to treat it. Does it represent some form of bias? Of stereotyping? Or lack of access to care?" It is probably a combination of all of those factors that prevents adequate treatment of hypertension in the black community, and the end result is that African Americans are more likely to develop further risk factors for heart disease, none of which are being treated aggressively enough to protect this population from early illness. "Our ability to intervene early and appropriately is limited," says Yancy. "That is something that we need to change because I think it's a crisis." Studies like this one that document the problem could be an important first step in sounding the alarm. Read "Eating a Bit Less Salt Can Be a Big Health Boon"